Tablighi jamaat 45th Bishwa Ijtema or Tongi Ijtema 2009,the 2nd largest Muslim congregation after the Hajj began January 21 ,2009 on the bank of Turag River at Tongi near the Dhaka city of Bangladesh. 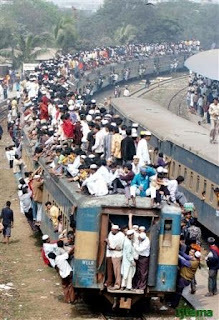 Ijtema organizers said more than 3 million peoples, including almost 10,000 foreign devotees with larger chunks from Saudi Arabia, China, India, , Japan, Singapore, UK, USA, Pakistan ,Kuwait and Malaysia are set to join the Talighi Jamaat 45th Bishwa Ijtema 2009. To make sure peaceful ending of the Tablighi Jamaat Bishwa Ijtema 2009 the police, RAB, plain clothe police and other security agencies workers were deployed couple of days before the start of the Bishwa Ijtema 2009 Tongi,Bangladesh.Peoples from all around of the world came to join the 45th Bishwa ijtema.Moulana Jamir Uddin and another Moulana delivered their sermon i.e. 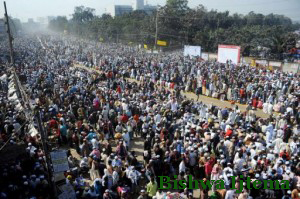 Bayan to the devotees of all Bishwa Ijtema. The muslims who did not come to join the Bishwa Ijtem 2009 and did not hear the sermon/Bayan of Ijtema 2009 ,they can be Listen the Bishwa Ijtem 2009 Bayan.